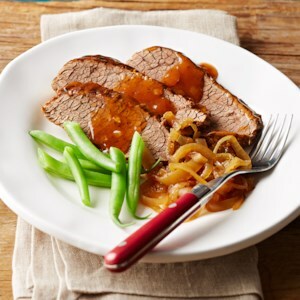 Find healthy, delicious beef brisket recipes, from the food and nutrition experts at EatingWell. 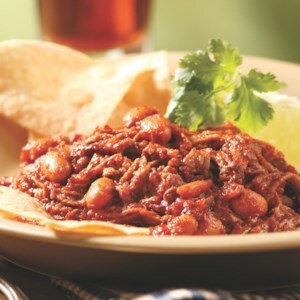 Beer and chili sauce flavor a robust beef brisket while it slowly simmers to tenderness in this slow-cooker recipe. 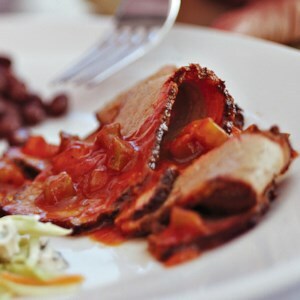 Moist and tender, this beef brisket recipe gets a triple dose of flavor from a wine mop sauce, a black pepper rub and a tomatoey barbecue sauce. 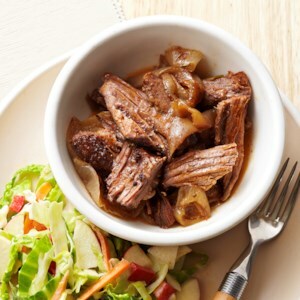 This delicious dinner, ready in just 30 minutes, uses reserved beef and cooking juices from the Wine-Braised Beef Brisket recipe. 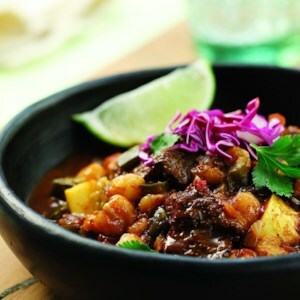 Got the weeknight "what's-for-dinner" blues? 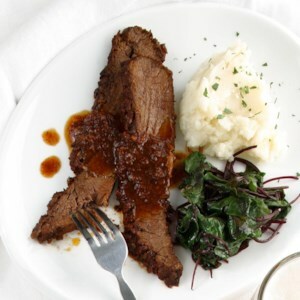 You'll sing another tune when you come home to a slow-cooked, tender beef brisket with a wine-enhanced sauce. 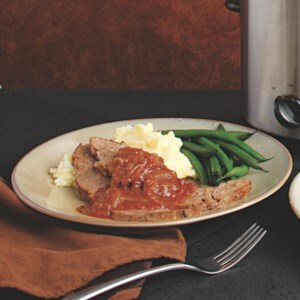 Served with mashed potatoes, this is comfort food at its finest. 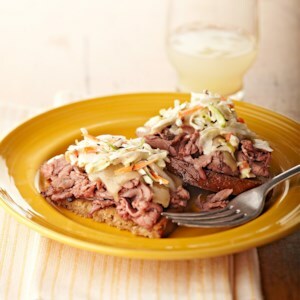 Reuben sandwiches on dark bread are served open-face style with the classic combination of deli roast beef, Swiss cheese, and a tangy cabbage mix. 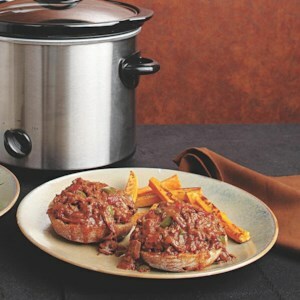 The flavorful gravy made from the beer-spiked cooking liquid is the finishing touch to this tender meat dish. 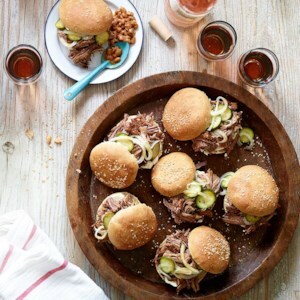 Chop the slow-cooked brisket and load up the sauce with veggies and some sweet and spicy seasonings and you get a great alternative to the traditional Sloppy Joe filling. 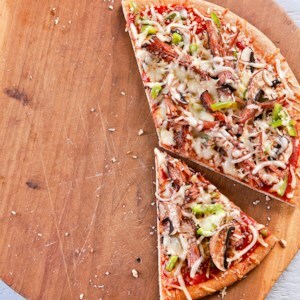 These are best served open-face with a fork and knife. 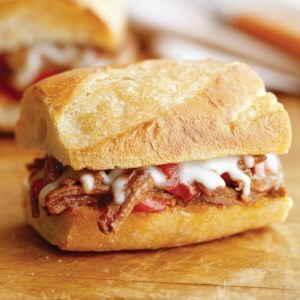 If you like your Joes extra sloppy, add more sauce along with the meat. 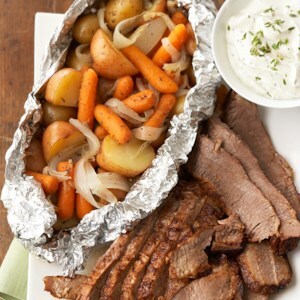 This healthy brisket recipe with roasted vegetables is unfussy and rustic. 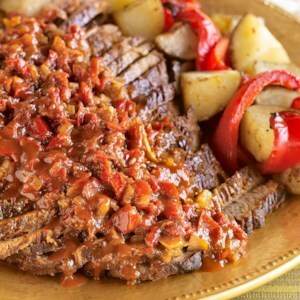 A long braise in a low oven coaxes the tenderness into this lean cut of beef and brings sweetness to the roasted peppers and potatoes. 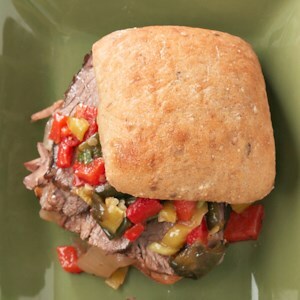 Leftover brisket reheats beautifully and is perfect for sandwiches the next day. 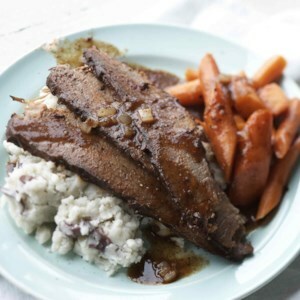 This brisket recipe comes from Roberta Greenberg, the longtime assistant to the rabbis at Temple Emanu-El, a well-known New York City synagogue. 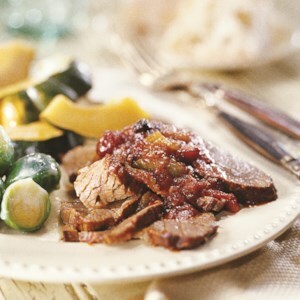 Quivering cranberry slices that melt into the meat and slowly caramelize give this brisket its lovely character. Even better is that it takes so little effort for this sweet alchemy to work. 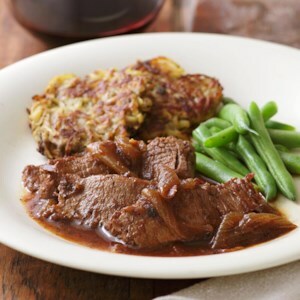 Serve with latkes and roasted green beans drizzled with balsamic vinegar. 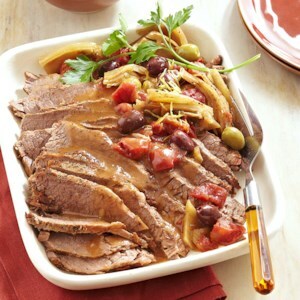 A relatively inexpensive cut of meat, a brisket needs to tenderize overnight before it's baked. Here we use a full-flavored, smoky barbecue dry rub, then it's slowly baked and basted. 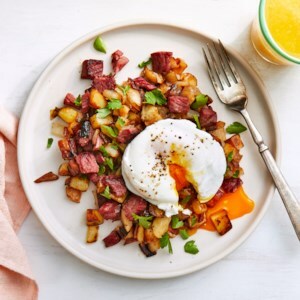 Brisket cuts are notoriously fatty, but the flat “first-cut” section is a far better choice for healthy eating than the fattier “point cut.” It may be worth calling ahead to make sure your supermarket or butcher has one on hand.